The Polycom VVX 500 phone provides personalized information at a glance, through built-in Web applications and even a digital photo frame. Polycom’s “My Info Portal” serves up stocks, news, sports, weather, and other streamed content directly to the phone screen. 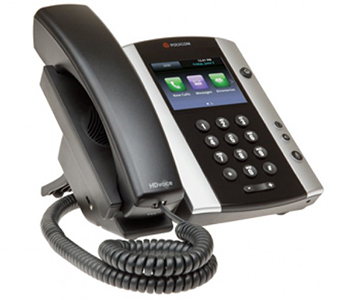 The Polycom VVX 500 phone is ready for future expansion modules and accessories for applications such as video conferencing and even wireless networking. 1. Most software-enabled features and capabilities must be supported by the server. Please contact your IP PBX/Softswitch vendor or service provider for a list of supported features. 2. To enjoy all the benefits of Polycom HD Voice when using the phone in the headset mode, you must use a wideband headset. Download the YipTel Polycom VVX 500 HD Datasheet (PDF).